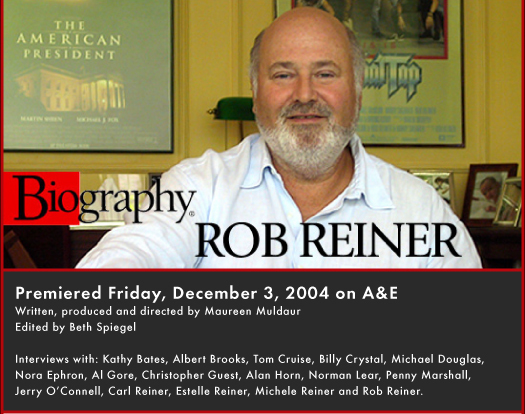 A&E’s Biography on Rob Reiner follows a career trajectory from Carl Reiner’s son to Carl Reiner’s equal. Rob’s drive to emerge from his father’s shadow into a world of his own making informs both his work and his passion for everything he does. Interviews with family, friends, and professional colleagues, including Carl Reiner, Albert Brooks, Billy Crystal, Christopher Guest, Kathy Bates, Nora Ephron, Michael Douglas, Al Gore, Penny Marshall, Norman Lear, and Tom Cruise, help paint the picture of a life that is filled with its fair share of success and struggle. For it would take a combination of determination and talent for Rob to find his own identity, a journey that involved great support not from his real father but from a man Rob calls his second father, Norman Lear. Lear helped Rob make the difficult jump from TV (All in the Family) to film (twelve features and counting). -- to Penny Marshall, and to current spouse, Michele. In addition to Rob’s work on All in the Family, we explore six of Rob’s films with comments from one of the lead actors, including This is Spinal Tap, Stand By Me, When Harry Met Sally, Misery, A Few Good Men, and The American President. It was with Stand By Me that Rob found the balance he was searching for (comedy and tragedy), and it was with this film that Rob finally went beyond his father’s work. But after great success as a director of many different genres, some began to question Rob’s passion for filmmaking when his focus seemed to be directed at politics, not to mention the fact that his last two films never hit the radar screen. With insight from Al Gore, we look at Rob’s intense desire to affect social change. In 1998, Rob spearheaded a successful California ballot initiative that today provides hundreds of millions of dollars a year to early childhood programs across the state. Now, because both filmmaking and social activism bring Rob immense satisfaction, where the future lies is anybody’s guess. Only time will tell where Rob decides to focus his endless energy and passion.